Darigold is expanding its portfolio of milk products to include FIT, an ultrafiltered, lactose free, high-protein milk. 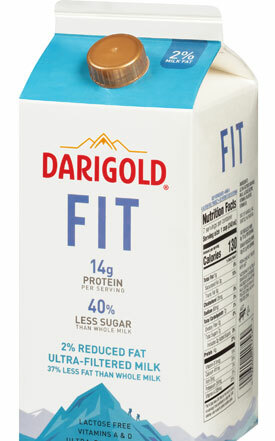 FIT delivers Darigold’s same delicious taste with 75 percent more protein and 40 percent less sugar than regular 2% milk. The farmer-owned co-op’s ultrafiltration process naturally concentrates protein and removes sugars. The result is milk packed with even more nutrition. As research indicates, nearly half of Americans strongly want to reduce sugar consumption and more than half of U.S. households consider protein to be an important attribute influencing purchasing decisions. Darigold is keeping pace with such rapidly changing consumer demands by offering an everyday milk with stronger nutritional value and no artificial ingredients. “The desire for high-protein, low-sugar food continues to increase, and we are thrilled to launch another product that provides healthy options for families,” said Duane Naluai, senior vice president of Darigold’s consumer products business. Darigold FIT is available at many Albertson’s, Fred Meyer, QFC, Safeway and Walmart stores. The new product is currently being sold in 59-oz. cartons with a suggested retail price of $3.99, and in 14-oz. bottles for on-the-go at $1.99 each. Darigold is also offering FIT Chocolate, with more protein, less sugar and fewer ingredients than its competitors. In addition to FIT, Darigold also produces the finest milk, butter, cheese, sour cream, cottage cheese, whipping cream, half & half creamer, lactose-free milk and RE:FUEL, a protein recovery shake. Darigold’s entire line of dairy products is rBST free. Headquartered in Seattle, Darigold, Inc. is the marketing and processing subsidiary of Northwest Dairy Association (NDA), which is owned by about 450 dairy farm families in Washington, Oregon, Idaho and Montana. Darigold handles approximately 10 billion pounds of milk annually. Darigold produces a full line of dairy-based products for retail, foodservice, commodity and specialty markets, and is one of the largest U.S. dairy processors. Darigold, Inc. operates 11 plants throughout the Northwest, processing high-quality milk produced by its dairy farm families. For more information, see darigold.com.